Comments: During March 2018, Gerry Fortin Rare Coins received a consignment containing an 1839 dime graded PCGS MS64. Obverse and reverse fields were prooflike with heavy die polish lines on the reverse at multiple angles. The first records of this dime appearing on the market are at the Heritage September 2015 Long Beach sale as lot 3402. 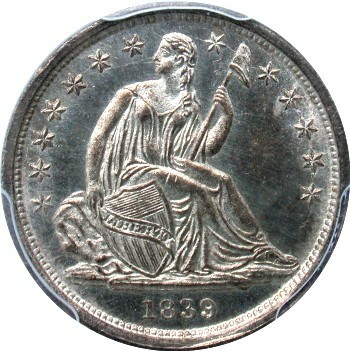 During that sale, Heritage described the 1839 dime as unlisted in the Fortin web-book. 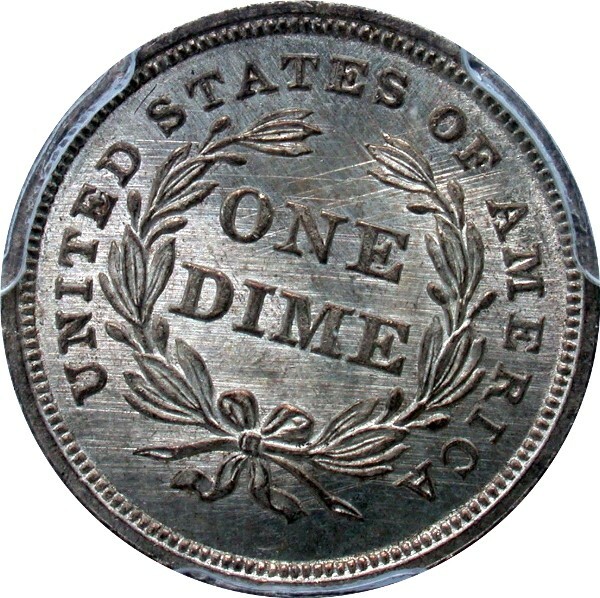 Upon consignment arrival, an in hand inspection allowed the determination that this strike took place very early during the Obverse 1 and Reverse D die pairing. During the initial Variety 104 die pairing, Obverse 1 is in the same die state as previous pairing with Reverse C and exhibits considerable die cracking. There is an obvious die crack from rim through Star 2 to Liberty's hand and then down through left side of shield with a final exit point through the 3 digit to rim. Additional die crack is seen starting at rim, through foot and then along Liberty's right leg. A third die crack is noted from top of Liberty's head through Star 8 and cap. Finally, a die crack connects Stars 10 through 13. Reverse D has been heavily polished with prooflike fields and bold die polish lines that run at multiple angles through the denomination. On the plate coin, the die scratch from STATE(S) to rim is visible and validates that this polished die is Reverse D. Interestingly, the reverse die rotation is left 18 degrees as will be seen in subsequent die states for this die pairing. Please see the above enhanced image that well illustrates the die polish lines.